Based on the Twitter conversations of New Hampshire residents, Cision data indicates that Republican Donald Trump and Democrat Bernie Sanders will win the Granite State’s delegates thanks to the state’s demographics and strong, sustained engagement with supporters. Last week, we accurately predicted the Iowa Caucus winners based on Twitter share of voice and sentiment data. 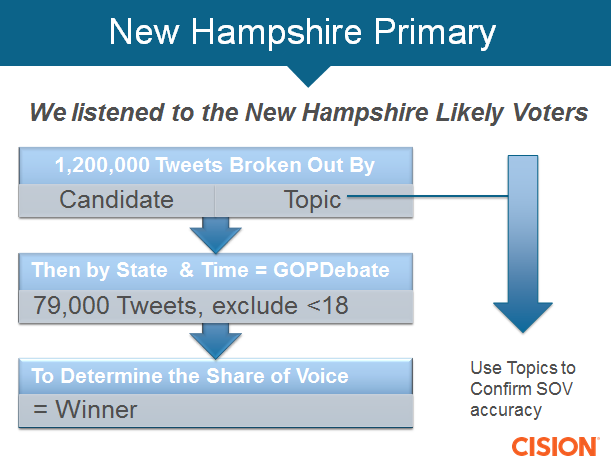 For the February 9 New Hampshire primary, we monitored Twitter conversations in the state from Wednesday, February 3 to Sunday, February 6. 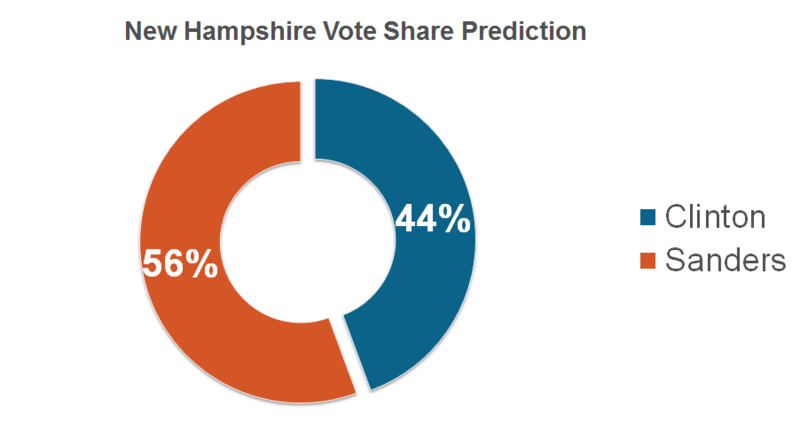 While some pundits argue about the statistical value of New Hampshire as the first full primary—which will be celebrating its 100th anniversary this year—winning it does shape the narrative leading into the South Carolina, Nevada and even Super Tuesday primaries. Bernie Sanders will win the New Hampshire primary earning 56 percent of the vote, outpacing former Secretary of State Hillary Clinton’s 44 percent. Clinton will not repeat her victorious comeback performance as she did over an invigorated and youthful Barack Obama in 2008. 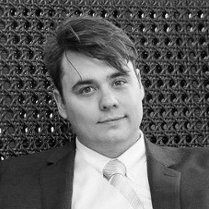 To carry the state, Clinton would need incredible turnout among residents between the ages of 45-64 and to hope for remarkably low turnout among Sanders’ younger voters (18-30) and more passionate campaign followers, namely millennials. That is not to say Clinton has not seen improvements in perception of her campaign, but it has yet to reach the degree needed to tip the scales in her favor. Sanders, on the other hand, has sustained 54 to 60 percent of the share of voice in New Hampshire even though Clinton managed to compete in terms of social mention share of voice with the Vermont senator during the last debate. After a good-enough debate performance by Trump and a robotic disaster for Marco Rubio, the billionaire is back on top. 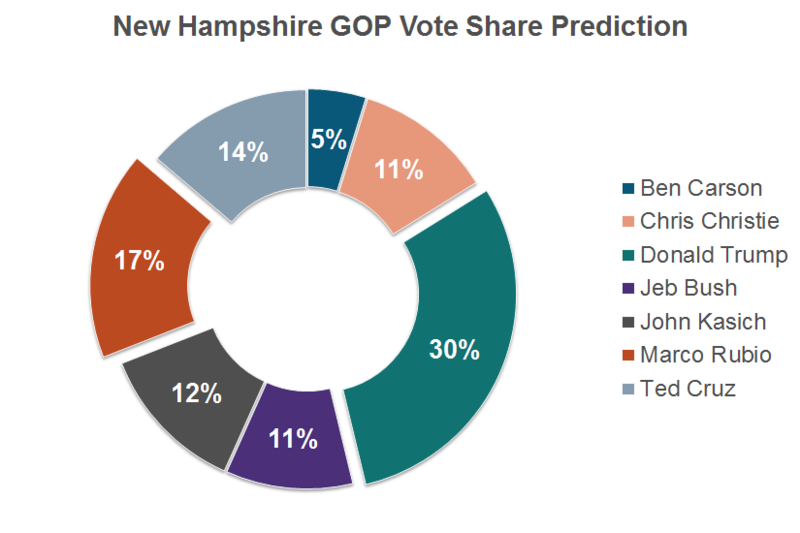 We predict that Donald Trump will win the New Hampshire primary carrying 30 percent of the vote, followed by Rubio with 17 percent, Ted Cruz earning 13.9 percent and John Kasich winning 12.4 percent of the vote. Rubio’s key messaging on abortion, between his accidental and oft-repeated attacks on President Barack Obama, has helped keep his candidacy relevant, though still second to Trump. Social predictive analyses like this go far beyond monitoring a single Twitter handle or hashtag. Instead, they dive deep into how people discuss a topic and a candidate. 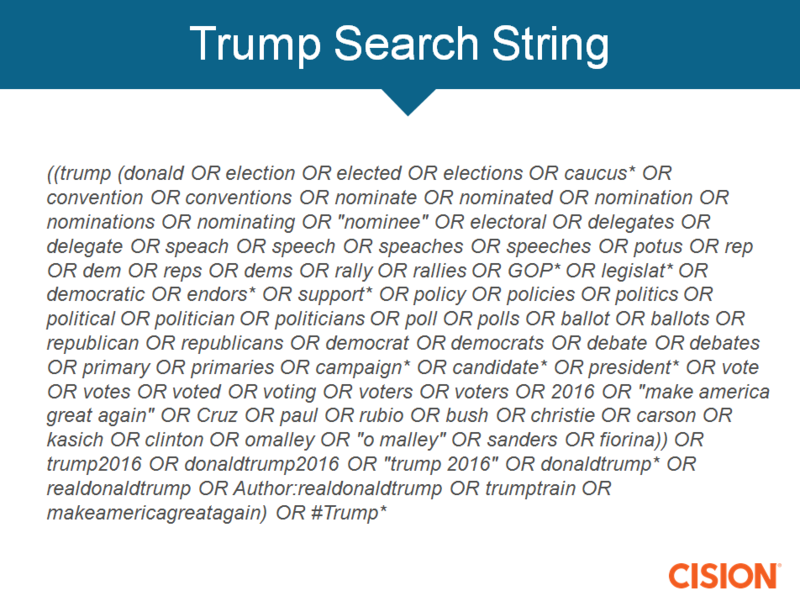 Our team of search analysts have written search queries like this for each region of the country, for each candidate and for more than 30 topics ranging from terrorism to pay equality. Together these account for more than 1,000 key terms monitored and filtered through geolocation, media type and demographic information. This gives us a unique perspective and reach into the public’s opinion and level of engagement nationally. To develop our prediction we monitored more than 1.2 million social mentions on Twitter over a four-day period, which we filtered down to more than 79,000 mentions from New Hampshire. Our share of voice analysis has two stages. 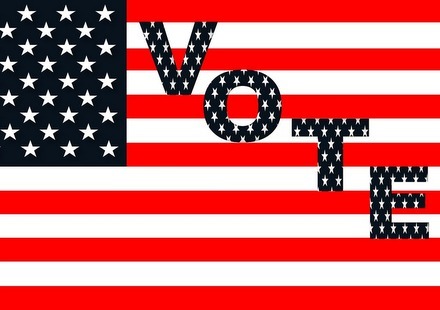 The first is a strict candidate share of voice, the number of mentions that include a specific candidate, and the second is based on the topics that voters speak on. We then compare the topic share of voice and the candidate share of voice to determine likely voter intention on a population level. Follow Cision’s daily coverage of the campaign trail and its candidates throughout February. Interested in these results? 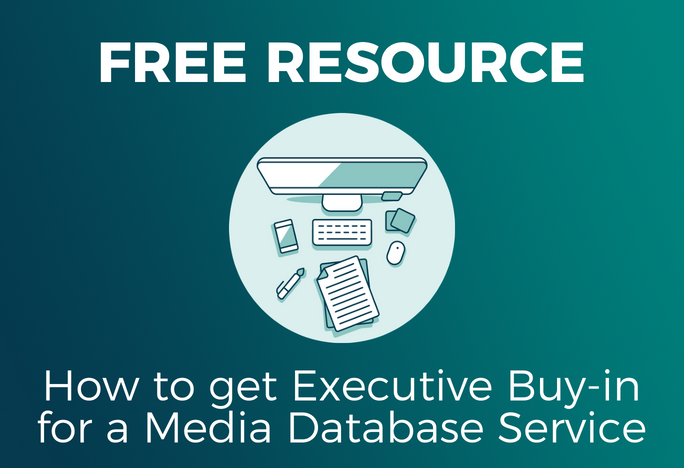 Learn how to conduct a predictive analysis of your own today.